The very attractive town of Kinsale is just 29km directly south of Cork City on the R.600 route. 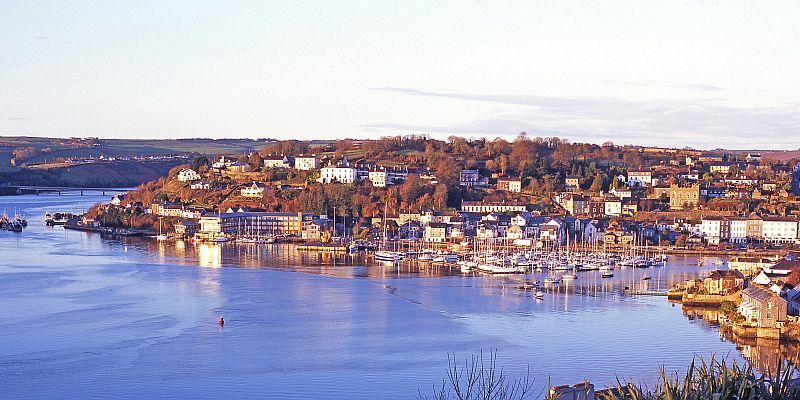 Kinsale has many popular attractions which include heritage, gourmet restaurants, sailing, deep sea angling and golf. Kinsale has been designated an Irish Heritage Town. Even the casual visitor to Kinsale will be captivated by its beautiful setting, with the long waterfront, narrow winding streets, and Compass Hill rising sharply behind the town. The River Bandon rises in West Cork and flows east through Bandon to Innishannon, and turns south to enter the sea at Kinsale. The old fortifications of Charles Fort and James Fort guard the narrow entrance to Kinsale from the sea. The Old Head of Kinsale has been attributed as the site for some of the earliest settlers in Ireland. Later a number of Christian settlements were established in the surrounding countryside. It was near here in 1601 that the Battle of Kinsale was fought. At this battle the Irish forces with their Spanish allies challenged the power of the English troops. In December of that year the English proved to be victorious. The great liner “Lusitania” en route from New York to Liverpool was lost 11.5 miles off the Old Head of Kinsale. On 7 May 1915 the vessel was hit by a German submarine torpedo. Of a total of 1,959 passengers on board 1,195 perished. For many years the exact cause of the disaster has been debated. One theory is that there was a major explosion on board the Lusitania. Three of the victims of the disaster are buried in the Churchyard of St. Multose Church in Kinsale. Kinsale owes its unique character to the fact that it was a garrison town and port of consequence for over 300 years, hence its magnificent Georgian houses and the Dutch influence of its architecture. It was also in the days of sail, the natural landfall for all ships from the continent and the Americas.